The West Australian Minister for Mines and Petroleum the Hon Bill Marmion MLA opened the IEAGHG International Carbon Capture Storage (CCS) Summer School at The University of Western Australia (UWA) yesterday. Now in its ninth year, the international school has welcomed 30 postgraduate students from 14 countries around the world and has over 20 CCS international and local experts who have come to UWA to engage in a week long program of discussions, mentoring and information-sharing around the CCS value chain. Mr Marmion said that Western Australia was honoured to host the CCS Summer School given the number of innovative projects being developed in this state. “Also, Chevron Australia’s Gorgon Project will incorporate the world’s largest CO2 injection project. The Carbon Dioxide Injection Project will inject and store CO2 in a deep reservoir unit more than two kilometres beneath the ground – reducing Gorgon’s greenhouse gas emissions by about 40 per cent,” Minister Marmion said. NGL Science Director and Summer School host Dr Linda Stalker (CSIRO) welcomed the attendees saying that in the wake of the United Nations on Climate Change Conference in Paris this week, timing could not be better for the CCS scholars. 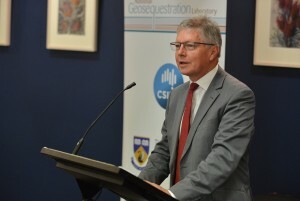 “The fact that the IEAGHG has opted to host the Summer School here in Perth demonstrates that the Australian CCS Research Community is an internationally recognised CCS entity and that our expertise is contributing to worldwide goals of reducing carbon emissions” Dr Stalker explained. “It is inspiring to see that the demand for this Summer School is high and we are grateful to Series Sponsors for collectively making it possible by funding the program here in Australia,” she said. Tim Dixon, Technical Programme Manager of IEAGHG said “We are very pleased to bring the International CCS Summer School to Australia, to benefit from the world-leading expertise here. As the Intergovernmental Panel on Climate Change (IPCC) has shown, the world really needs CCS, far more than many appreciate, so we have to encourage and grow the expertise to enable CCS to deploy; and this Summer School in Perth is intended to contribute towards that goal”. Students (from UK, Belgium, Germany, Norway, Sweden, Switzerland, Czech Republic, China, Australia, South Africa, Spain, Mexico, USA and Canada) will gain a broad overview of the technology and implementation of CCS and will leave at the end of the week having developed a network of contacts in the field of CCS. “Overall, it is appropriate that industry, government and communities engage researchers to work together on implementing a global solution to achieving large scale carbon emission reductions,” Mr Stickells said. Mr Dixon, fresh from COP21 in Paris added, “The world’s countries are currently negotiating a new agreement on climate change in Paris, and CCS will need to play an important role in achieving the reductions in greenhouse gas emissions”. UK Department of Energy and Climate Change, Statoil, Shell, the CLIMIT Program in Norway, Swiss Federal Office of Energy and to Elsevier for providing a best student award, and local sponsors Australian National Low Emissions Coal Research & Development, CSIRO, Curtin University, CO2CRC, Energy and Minerals Institute, Global Carbon Capture and Storage Institute, Shell Australia, National Geosequestration Laboratory, The University of Western Australia, The University of Adelaide and the Western Australia Department of Mines and Petroleum.